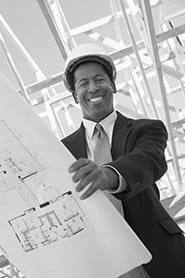 Building structure engineers perform engineering duties in planning, designing, and overseeing construction and maintenance of building structures. Conduct preliminary research, for example by examining building sites. Consult with clients and other relevant parties (such as government authorities, engineers) to obtain relevant information. Design the framework of buildings. Develop building plans in accordance with relevant building codes and regulations. Give advice to clients and other parties involved, for example on materials and working procedures. Prepare sketches, scale drawings, etc., for example using computer-aided design (CAD) equipment. Describe building materials specifications and standards that have to be complied with. Evaluate and incorporate work plans and drawings of third parties. Negotiate with building contractors, for example on costs and work planning. Coordinate and administer the preparation and execution of building projects. Control and supervise all stages of construction. Inspect project sites to coordinate work, monitor progress and ensure conformity to design specifications and standards.